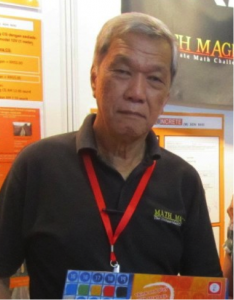 Jimmy Yeoh is the inventor of an amazing mathematics board game that helps your young children master basic mathematics by getting them to practise calculations without any protests. Once they’ve learned the simple rules, they will look forward to playing it all the time, because it’s just so much fun to play. Each round of the game involves over 500 basic mathematical calculations and quite a bit of strategy – which makes it extremely efficient and effective in helping a child master maths. His Math Magic board game has been described as the mathematical version of Scrabble. However, it goes where Scrabble cannot because math concepts are understood in any language and thus a Math Magic game can be played by any 4 people of various nationalities where none speak each other’s language. Jimmy also holds international Math Magic competitions which are eagerly participated by schools from various countries. The winners not only get to brag about their math skills but also their strategic skills as a Math Magic game cannot be won by perfect mathematical scores alone – which is why it’s such a great game to teach young children, as strategic skills can be very useful later on in their lives.